Your North New Jersey home is one of the most important investments you have, and maintaining it is an important part of ownership and preserving its value. 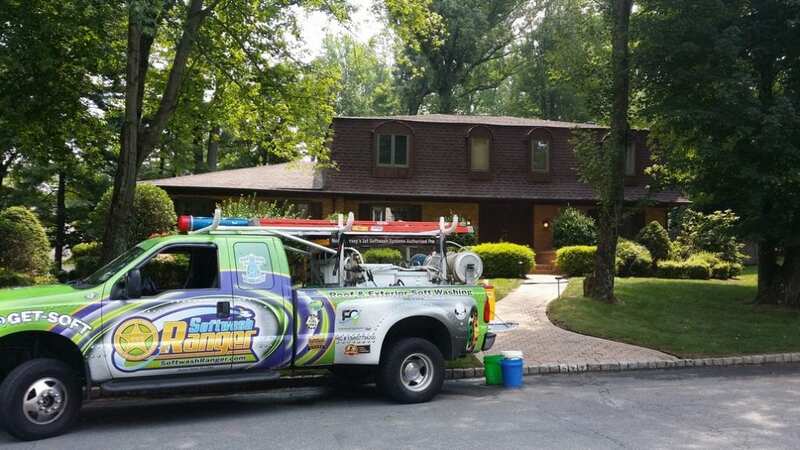 North New Jersey Roof Cleaning is not just about cosmetic appearance. There is real danger to your roofing system if Gloeocapsa Magma is present. Gloeocapsa Magma is a type of algae, when growing on your roof, gives your roof dark brown or black streaks. Most roofing products today are designed to last in excess of 30 years when properly maintained. If the roof is not properly maintained, the black streaks will spread as your roof is quietly being attacked. This algae is eating the limestone-based filler that is a part of your roofing shingles. This can cause anything from roof leaks to shingle damage, leading to the premature replacement of your roof. Pressure Washing will only spead the algae around and also wash away the protective granules that make up the top layer of your shingles. 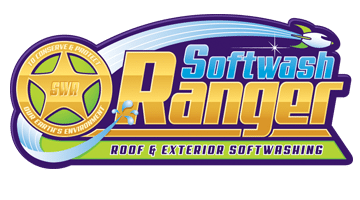 The simplest way to remove the black streaks from a roof is to call a SoftWash Systems™ 5-Star Professional Roof Cleaning Contractor like Softwash Ranger. 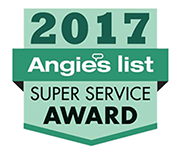 We use a softwash system to fully kill and remove all the algae, mold, mildew and bacteria that are discoloring and decomposing your roof. 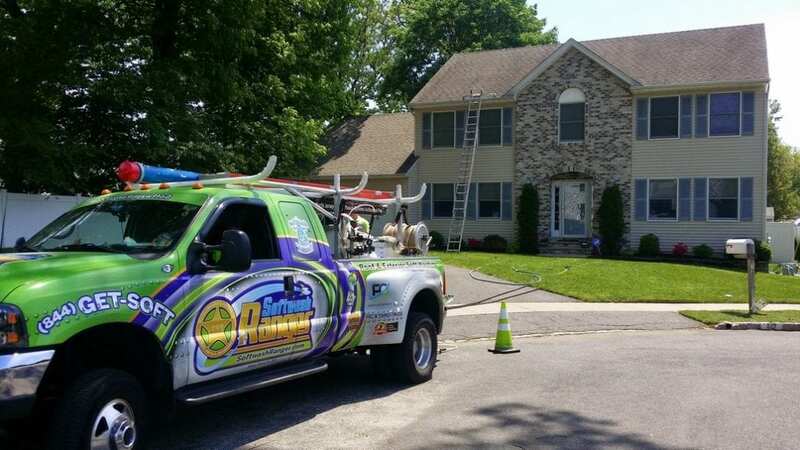 Our SoftWash Systems™ technology destroys all of the undesirable organisms infesting your roof. 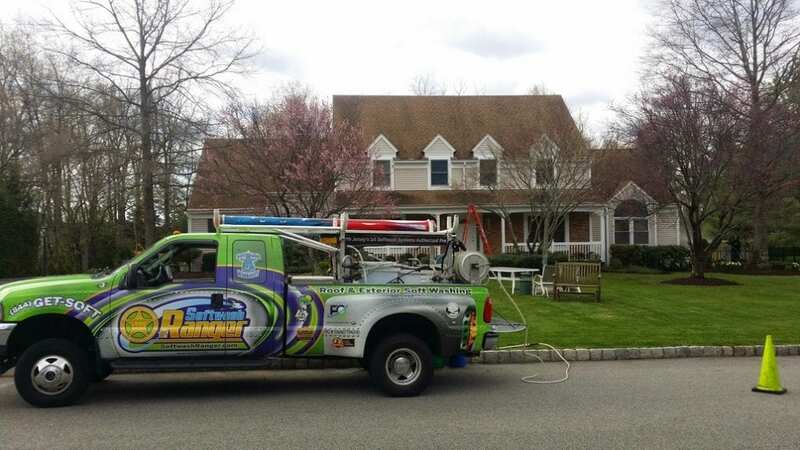 We do not utilize damaging pressure washing to clean your shingles. 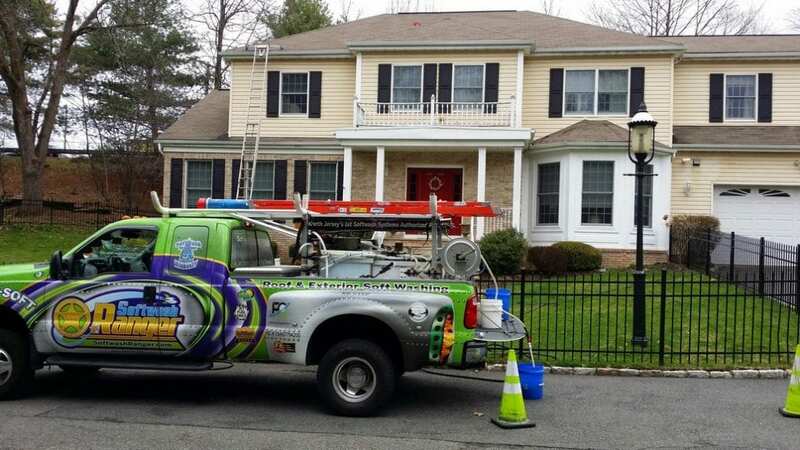 Our biodegradable non-hazardous chemicals treat the organisms on your roof like a pest, not a stain, achieving long-lasting results without damaging your property's roof. Aside from getting rid of those awful black streaks, proper maintenance of your roof will increase its longevity. 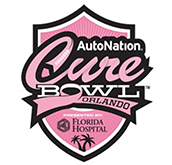 Roof Replacement is extremely expensive compared to the cost of roof cleaning. Algae and mold can cause allergic reactions and other health issues. Removing them from any part of your home is always a good idea. 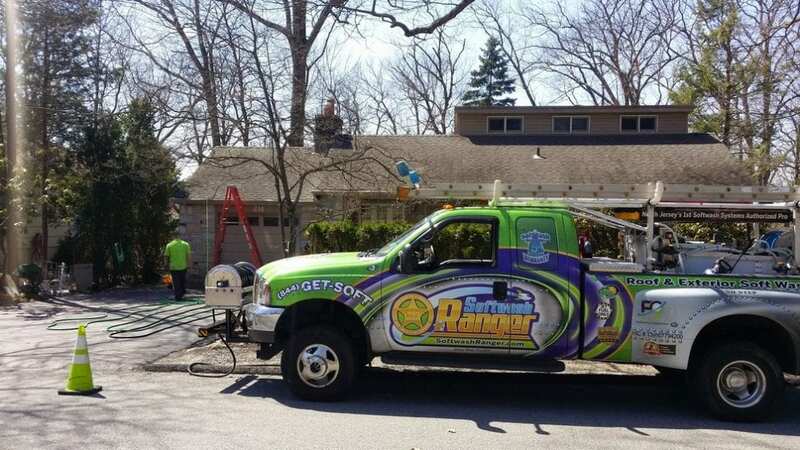 At Softwash Ranger, our roof cleaning experts will remove all the debris and stains, along with dirt and biological growth which has accumulated on your roof, restoring its original condition. 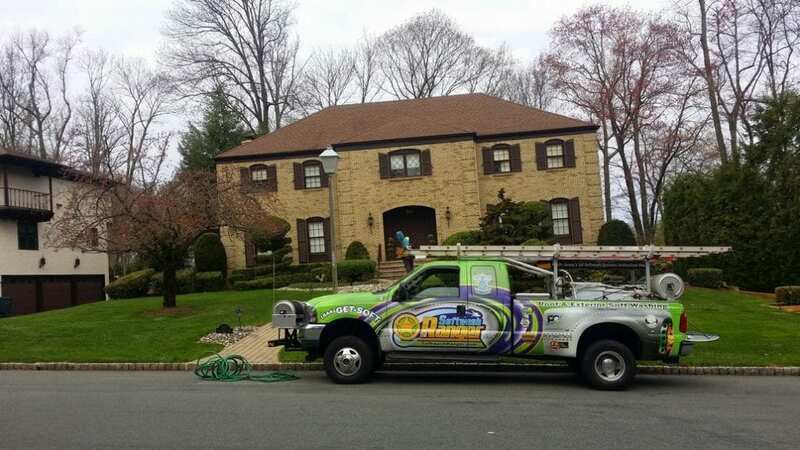 Improve your curb appeal and protect your home with the roof cleaning services from you trusted North New Jersey Softwashing and Power Washing Contractor. Stage one is easy to see on the north and west sides of your roof. There, because the direction of the rising and setting sun, the roof gets less direct sunlight and therefore stays moist longer from the morning dew-points and humidity. On these sides of the roof spores from a decomposing bacteria called Gloeocapsa Magma will land and take root. These spores which need little nutrients to grow will flourish feeding only on dust settling on the roof as well as the limestone filler found in the shingles. They will grow and create silver dollar size colonies that will show as black spots on the roof. Eventually because the roof is pitched these round colonies will begin to elongate and appear as streaks. Though Gloeocapsa Magma is not highly destructive at this point they are increasing under roof temperatures as they darken the roof. Also as they eat they give off waste which is acidic as well as creates a nutrient base for later destructive fungal arrivals. Stage one roofs have little irreversible damage and can easily be treated. Also catching your roof at this stage can save you significantly on treatment costs. Stage two is where now these streaks from the Gloeocapsa Magma begin to grow together and weave a bacteria mat on your roof. Now you will notice that the north and west sides of the roof are in stage two and the south and east are beginning stage one. Stage two is where damage really starts to happen. Now the bacteria is at an infestation level. Your once clean roof that was designed to reflect heat from the sun is beginning to absorb heat because of its darker stained color. Heat begins to build up in your roof joists, attic and other areas between the roof and your buildings dwelling area. 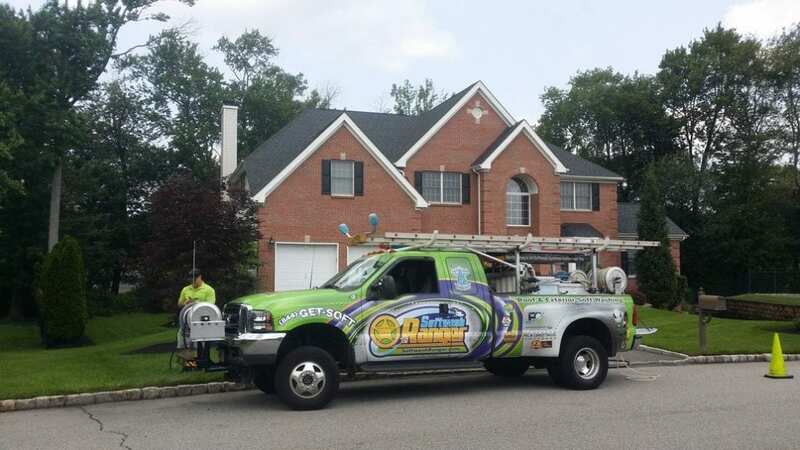 This effects you below as higher cooling costs as your HVAC unit struggles to keep up and effects you above as the excess heat on the roof begins to dry the asphalt in the shingles causing them to fail. Though Gloeocapsa Magma is not as destructive as many molds and fungus it still has a filament root system that now is lightly also digging into your shingles like a trees roots through a sidewalk. Stage two roofs need treated immediately to break the upcoming cycles and damages of stage three and four. Stage three is where we find most roofs. Now the roof system is about 80% covered on the north and west sides and the south and east are at about 50% coverage. The under roof temperatures are in excess, electric bills are high, shingles may be swelling or curling and by now there is evidence of a loss of aggregate (small rocks that cover the shingles and protect the asphalt and fiberglass) in the homes gutters. The Gloeocapsa Magma has now by feeding on dust, soil, limestone and other materials on the roof, given off enough wast to create the perfect habitat for some new invaders. 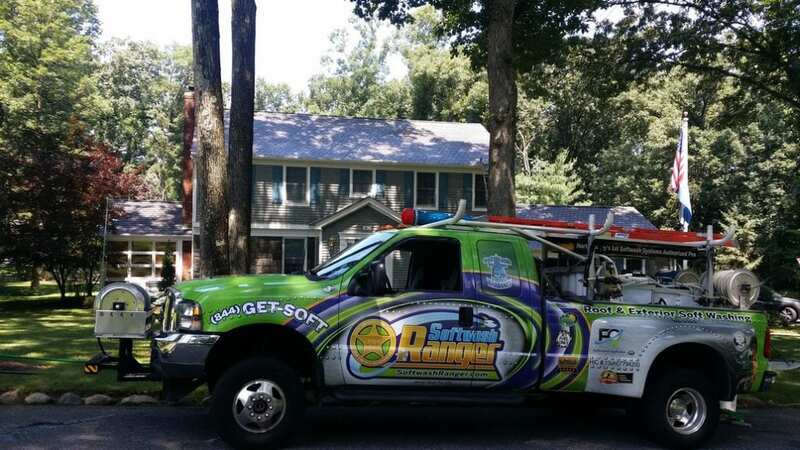 Now fungus, mold and mildew have enough to feed on and their air born spores settle in on your roof and take root. Algae, mold, mildew and fungus are what nature uses to break down rocks and trees into soil. They are aggressive decomposers and have evasive filament root systems that will begin to tear your shingles and other roofing materials apart. Now the real damage begins as they consume your roof and also generate large amounts of waste and cause the roof to hold more moisture like a sponge. A roof in this stage needs treated "softwashed" immediately with SoftWash Systems Green Wash and put on a monitoring program like SoftWash Systems 5 Year Spot-Free Warranty. Stage four is where we often find neglected roofing systems. Because of the now heavy weaving, matting and destruction of the filament root systems these roofs are ripe for the next arrivals in the decomposition of your roof, moss and lichens. Moss and lichens have the most destructive filament root systems, hold the most water and moisture and also often allow insects like carpenter ants to make nests right in your roof. These types of roofs can be saved if properly treated by a SoftWash Systems Authorized Professional. Special care must be taken to kill but not mechanically remove the moss and lichen. Picking, brushing, blasting away the moss or lichen while it is alive and has a hold of your roof, can cause holes, voids and other reversible damage in your roofing system. These stage four roofs may require several treatments of SoftWash Systems chemicals even over two or more visits. The algae, mold, mildew, fungus and bacteria will come clean on the first visit. However the moss and lichen after treatment will turn almost white like cotton and need weathered away over time NATURALLY as part of their death process. Then once dead the body of the moss and lichen will separate from the filament root system allowing the growth above the surface of the shingle to weather away and the roots below to decompose over time. Sometime after the moss and lichen are confirmed dead they can be gently push broomed off of the roofing surface. Stage four infestations need addressed IMMEDIATELY and should not be ignored. Stage four infestations can cut the service life of a roof in half or more and in many cases take a 30 year shingles service life down to ten years.